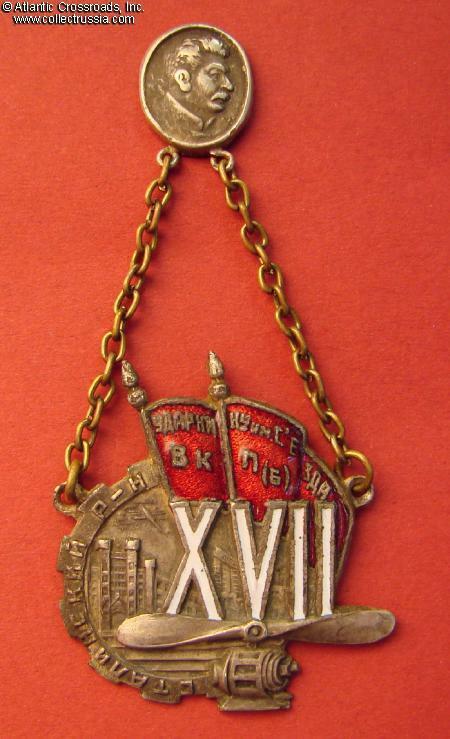 Badge to a Shock Worker of the XVII Congress of VKP(b), Stalinskiy District, 1934. 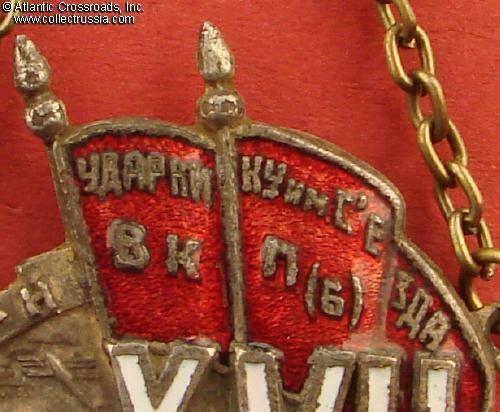 Badge to a Shock Worker of the XVII Congress of VKP(b), Stalinskiy District, 1934. Magnetic steel, silver plating, enamels. 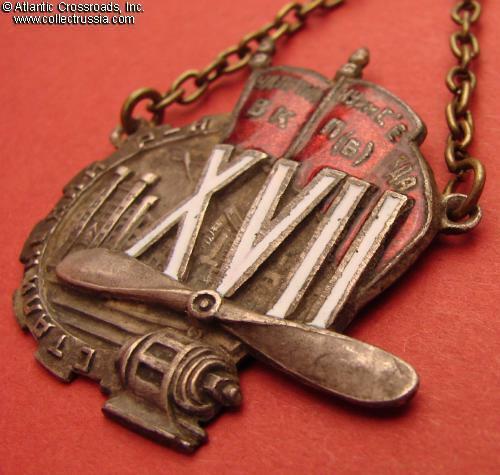 Medallion measures 36.4 mm in height (including the upper flagpole finial). In outstanding, excellent condition. The enamel is magnificently well preserved, without even the slightest wear or flaking. The details are extremely crisp; the silver plating is completely intact. 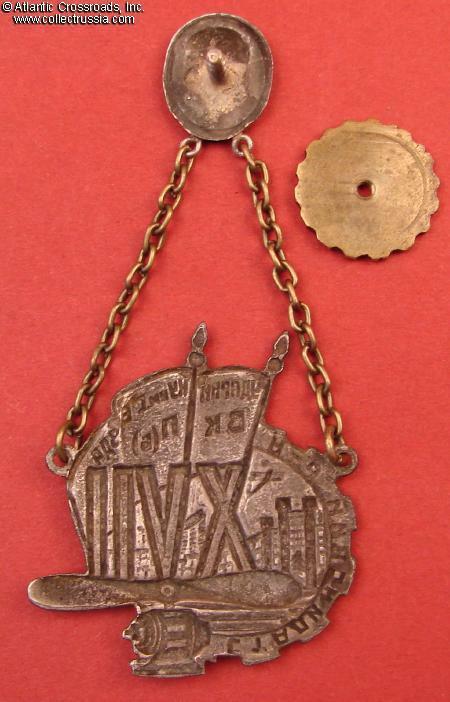 This is a highly unusual case for a badge made in steel which often oxidizes leading to both heavy pitting of the surface and damage to the enamel. The chain is original and complete. The screw post is full length, over 8 mm. 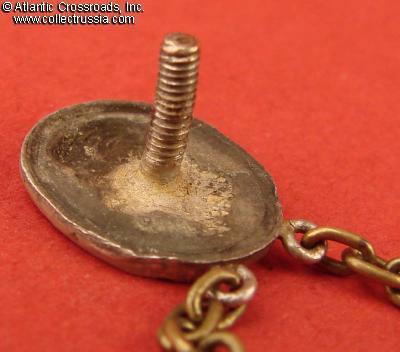 The screw plate is of the period and fits perfectly although it is probably not original to the badge. 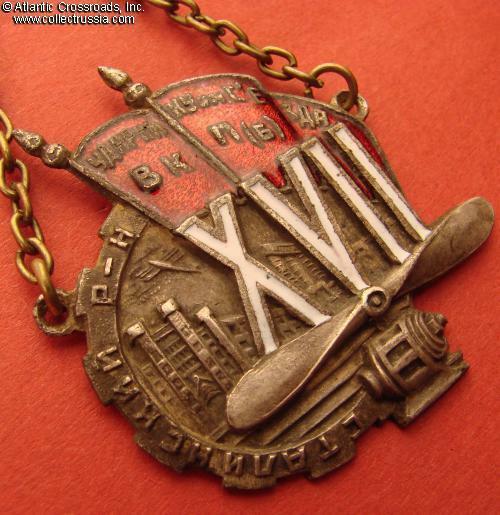 This is a superb example of the early Soviet award dedicated to a particular event - in this case a Communist Party Congress - and bestowed by a local authority (a district in the city of Moscow). 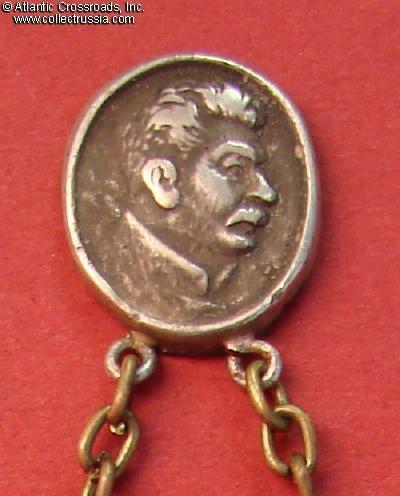 Note the distinctly early style of the artwork including the "young" Stalin's portrait, as opposed to the more "fatherly" image found on the later awards. Interesting background with futuristic looking buildings and a biplane. 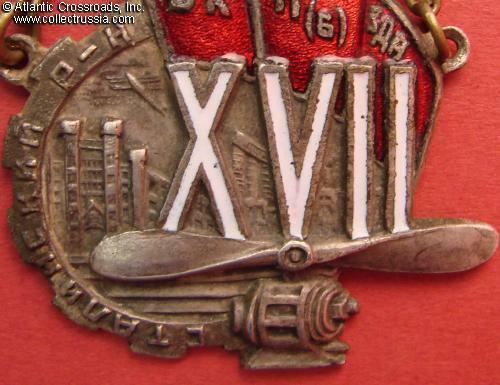 The XVII Party Congress was trumpeted as the Congress of the Victors referring to the final victory in collectivization (the war on farmers) and the successful completion of the First Five Year Plan projects. It is also commonly known as the "Congress of the Executed": most of its delegates did not survive the purges of the late 30s.